This species is accepted, and its native range is W. Canada to N. Mexico. Perennial; culms solitary. Rhizomes elongated; scaly. Culms erect; 40-120 cm long. Culm-internodes glaucous; distally glabrous. Leaf-sheaths glabrous on surface, or pubescent. Ligule an eciliate membrane; 1 mm long; truncate. Leaf-blades flat, or involute; 3-6 mm wide; coriaceous; stiff; glaucous. Leaf-blade surface ribbed; glabrous, or pubescent. Inflorescence composed of racemes. Peduncle glabrous, or pubescent above. Racemes 1; single; bilateral; 6-20 cm long. Spikelet packing broadside to rhachis. Rhachis internodes linear. Spikelets appressed; in pairs. Fertile spikelets sessile; 2 in the cluster. Spikelets comprising 4-6 fertile florets; with diminished florets at the apex. Spikelets oblong; laterally compressed; 6-10 mm long; breaking up at maturity; disarticulating below each fertile floret. Glumes collateral; persistent; similar; shorter than spikelet, or reaching apex of florets, or exceeding apex of florets. Lower glume subulate; 5-15 mm long; coriaceous; 1 -veined. Lower glume lateral veins absent. Upper glume subulate; 5-15 mm long; coriaceous; 1 -veined. Upper glume lateral veins absent. Fertile lemma lanceolate; 6-10 mm long; coriaceous; without keel; 5 -veined. Lemma apex acute; muticous, or mucronate. Palea 2 -veined. Apical sterile florets resembling fertile though underdeveloped. Perennial; culms solitary. Rhizomes elongated. Culms erect; 15-75 cm long; 1-2.5 mm diam. Culm-internodes distally glabrous, or pubescent. Leaf-sheaths smooth; glabrous on surface. Leaf-sheath oral hairs ciliate; 1-2 mm long. Leaf-sheath auricles absent, or falcate; 0.4-0.8 mm long. Ligule an eciliate membrane; 0.3-0.5 mm long; erose; truncate. Leaf-blades 4-29 cm long; 1-2(-5) mm wide; coriaceous; stiff. Leaf-blade venation with 6-10 secondary veins. Leaf-blade surface ribbed; scabrous; rough adaxially; pilose; sparsely hairy. Inflorescence composed of racemes. Racemes 1; single; bilateral; 1.5-27 cm long; 4-15 mm wide. Rhachis glabrous on surface, or puberulous on surface; ciliate on margins. Rhachis hairs 0.5-1 mm long. Spikelet packing broadside to rhachis. Rhachis internodes linear; 7-20 mm long. Spikelets appressed; solitary (or paired at base of raceme). Fertile spikelets pedicelled. Pedicels 1-2(-5) mm long. Spikelets comprising 3-12 fertile florets; with diminished florets at the apex. Spikelets oblong; laterally compressed; 16-25 mm long; breaking up at maturity; disarticulating below each fertile floret. 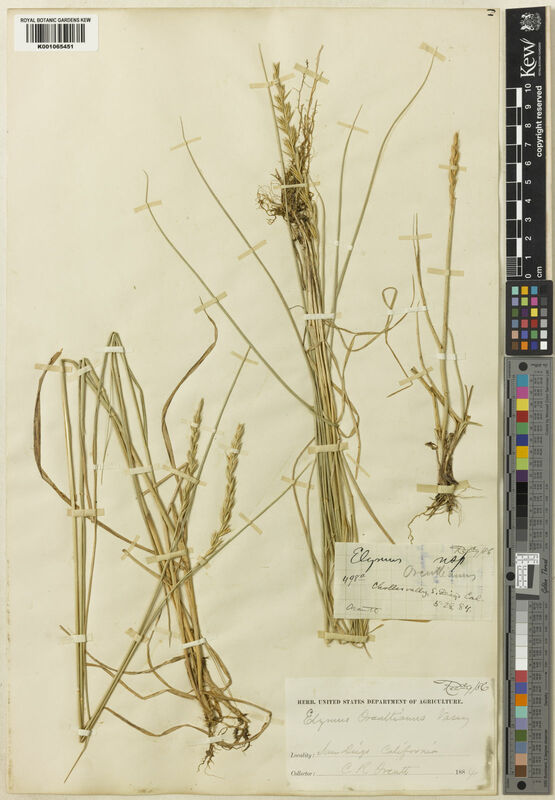 Glumes collateral; persistent; similar; shorter than spikelet. Lower glume lanceolate; 8-12 mm long; 1 length of upper glume; coriaceous; 1-keeled; 0-1(-3) -veined. Lower glume lateral veins absent, or obscure. Upper glume lanceolate; 8-12 mm long; coriaceous; 1-keeled; 0-1(-3) -veined. Upper glume primary vein absent, or obscure. Upper glume lateral veins absent, or obscure. Fertile lemma lanceolate; 7-12 mm long; coriaceous; without keel; 5 -veined. Lemma apex acute; awned; 1 -awned. Principal lemma awn 2.3-6.5(-12) mm long overall. Palea 2 -veined. Apical sterile florets resembling fertile though underdeveloped. Anthers 3; 3.7-4.5 mm long. Triticeae. Fl N Amer 2007. 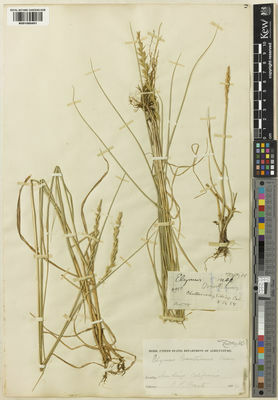 Elymus condensatus var. triticoides (Buckley) Thurb. Elymus triticoides var. pubescens Hitchc. Elymus triticoides var. simplex (Scribn. & T.A.Williams) Hitchc.